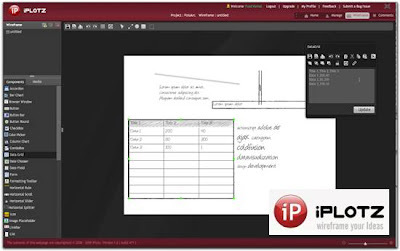 iPlotz is a adobe AIR based cross platform web tool which allow you to create clickable, navigable interactive wireframes for prototyping websites and software applications. The mockups created by iPlotz is a clickable, navigable, so you can easily shared with your clients, pages can be added, deleted, renamed, and easily exported as a png, jpg or pdf. Drag and drop components onto a resizable page, link them or add hotspot links to other pages or external web pages. Once your Mockup design are ready, You can easily invite other to give there feedback about your design and then manage the tasks for developers and designers to build the project. Simple, drag and drop interface. Built on Adobe AIR. Upload, drag and drop your own images onto a page. Export pages as png, jpg or pdf. Invite others to comment on pages. Share editing rights with others on projects, so that they can modify wireframes too. Add tasks for project members to handle coding and design.